The index opened flat around 7785, and stayed in a narrow range of 20 points for the better part of the first half, but saw huge un-winding to close nears the lows of the day at 7721.30, a huge loss of 70.10 points. The broader market was also weak, with 728 advances to 789 declines. Range at the start of the series works out to 7300-8000. Call option 7500-8300 added huge 46.36 lacs OI. 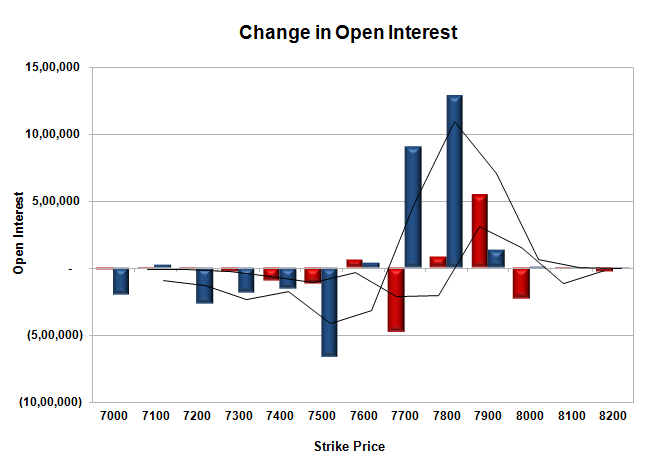 Put option 7700-7100 added huge 39.29 lacs OI with short covering seen at 7800 strike price. Nifty Open Interest is at 1,32,17,950 up by 32,70,550, whereas July series was down by 29.05 lacs with decrease in price, most probably 100% rollover with small short build-up. Bank Nifty Open Interest is at 12,99,300 up by 3,21,500, whereas July series was down by 3.49 lacs with decrease in price, mostly rollover with small long liquidation. FII’s bought 1.00 lacs Futures, which includes 91863 contracts long liquidation and 119293 contracts short covering, with decrease in net OI by 211156 contracts (includes 157609 longs to 155604 shorts for the day) and the average price per contract comes to around 7740.97. FII’s Index future open contract as on date is 191021 Longs to 74938 Shorts. Initial support at 7700, with huge addition of 7.79 lacs OI for the day, whereas best support at 7300 with highest OI of 48.18 lacs. Initial resistance at 7800, with huge addition of 6.34 lacs for the day, whereas best resistance at 8000 with OI of 39.94 lacs. Day Range as per Option Table is 7675 - 7799 and as per VIX is 7665 - 7777 with 7741 as the Pivot. The index opened flat around 7746, but saw selling pressure from the onset to move to the lows of the day at 7707. The responsive buyers came back to pull the index out of red and to the highs of the day around 7800 to close just below 7791.40, gain of 41.75 points. The broader market though was weak, with 737 advances to 803 declines. Range for expiry has boiled down to 7700-7850. No Call option addition was seen whereas huge short covering was seen at 7800 and below strike prices. Put option 7800-7700 added huge 7.72 lacs OI with profit booking seen at 7600 and below strike prices. Nifty Open Interest is at 96,68,000 down by 22,62,900, whereas Aug series added 37.06 lacs with increase in price, most probably 100% rollover with huge long build-up. Bank Nifty Open Interest is at 12,93,200 down by 2,01,950, whereas Aug series added 1.89 lacs with increase in price, mostly rollover with small long liquidation. FII’s bought huge 8.11 lacs Futures, which includes 33221 contracts long addition and 16996 contracts short addition, with increase in net OI by 50217 contracts (includes 204827 longs to 188602 shorts for the day) and the average price per contract comes to around 7797.79. FII’s Index future open contract as on date is 282884 Longs to 194231 Shorts. 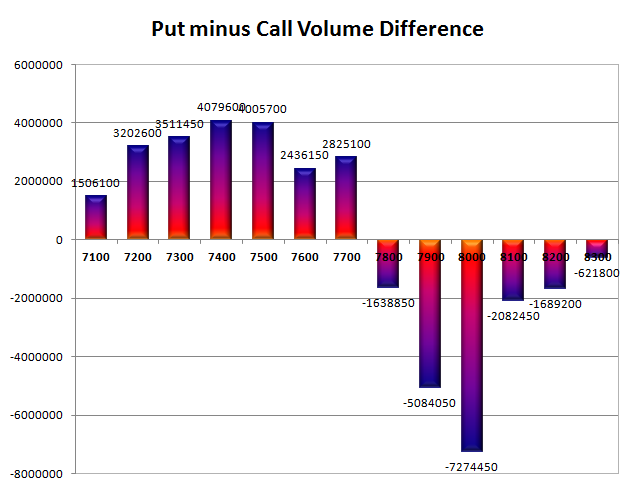 Initial and best support at 7700, with huge OI of 68.68 lacs. 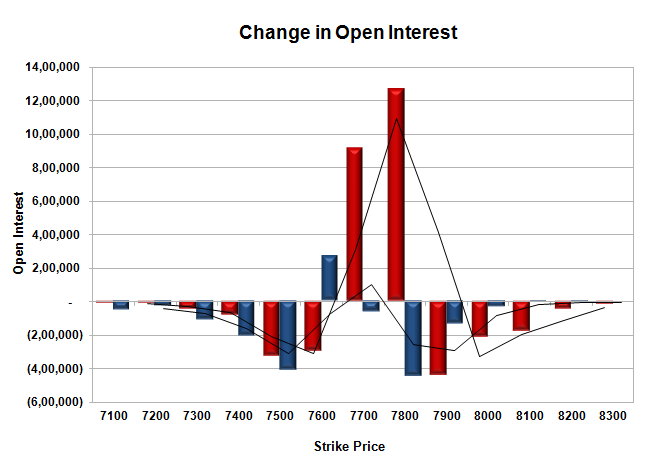 Initial resistance at 7800, with OI of 57.27 lacs and above that at 7900 with OI of 43.64 lacs. Day Range as per Option Table is 7710 - 7835 and as per VIX is 7735 - 7848 with 77 as the Pivot. The index opened flat around 7800 level, but saw huge selling pressure from the onset to move to the lows of the day at 7722. The buyers tried to pull the index back but were unable to move much and closed weak at 7748.70, loss of 41.75 points. The broader market was also weak, with 520 advances to 1024 declines. Broader range for the series has moved down to at 7650-7850. Call option 7700-7800 added 21.89 lacs huge amount of OI with profit booking seen at 7900 and above strike prices. 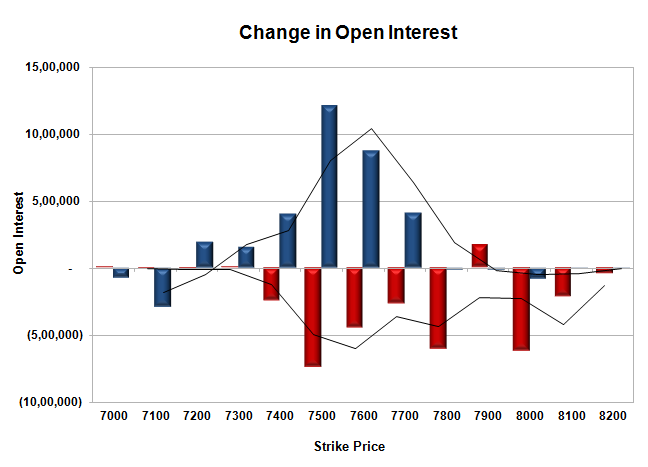 Put option 7600 added 2.72 lacs OI with short covering seen at 7700 and above strike prices. Nifty Open Interest is at 1,19,30,900 down by 29,19,050, whereas Aug series added 29.30 lacs with decrease in price, most probably 100% rollover. Bank Nifty Open Interest is at 14,95,150 down by 3,50,625, whereas Aug series added 3.46 lacs with decrease in price, mostly rollover with small long liquidation. FII’s bought 0.39 lacs Futures, which includes 14513 contracts long addition and 14513 contracts short addition, with increase in net OI by 28246 contracts (includes 143386 longs to 142606 shorts for the day) and the average price per contract comes to around 7735.33. FII’s Index future open contract as on date is 249663 Longs to 177235 Shorts. 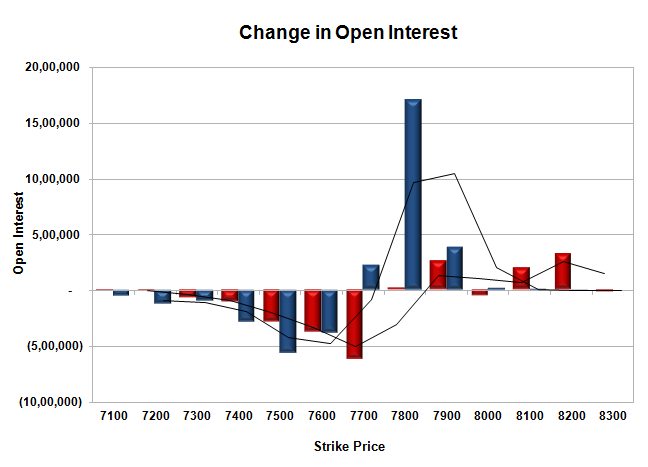 Initial and best support still at 7700, with huge OI of 63.69 lacs. 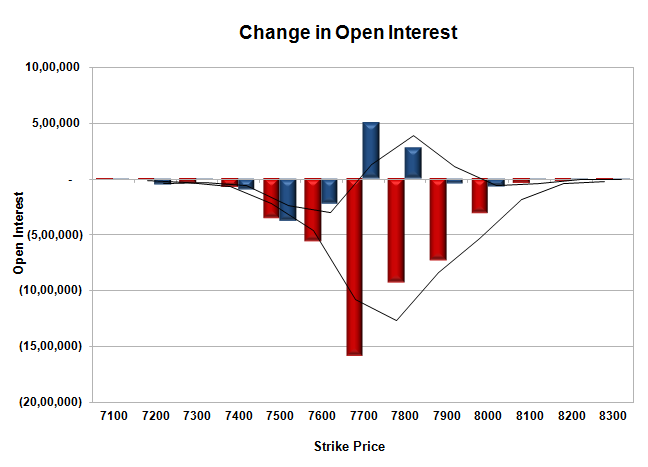 Initial resistance at 7800, with OI of 66.64 lacs and above that at 7900 with OI of 51.00 lacs. Day Range as per Option Table is 7693 - 7817 and as per VIX is 7691 - 7807 with 7757 as the Pivot. The index opened flat, but saw huge selling pressure from the onset to move to the lows of the day at 7748. The buyers tried to pull the index up from the lows but were unable to do much and Nifty closed at 7828.20, loss of 40.15 points. The broader market was also weak, with 387 advances to 1162 declines. Broader range for the series is at 7700-7900. 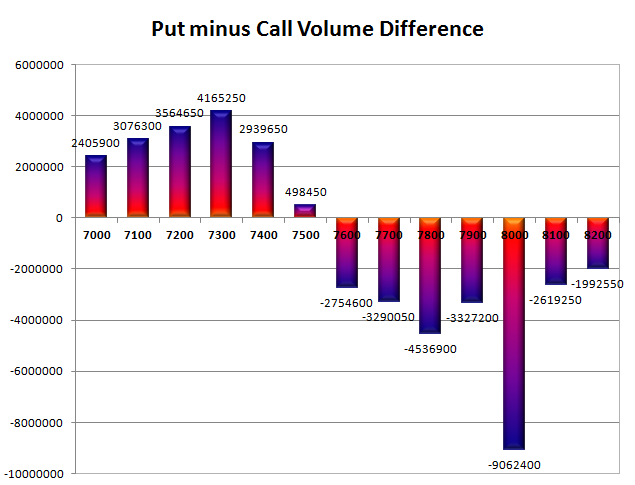 Call option 7800 added 6.89 lacs huge amount of OI with profit booking seen at 7900 and above strike prices. 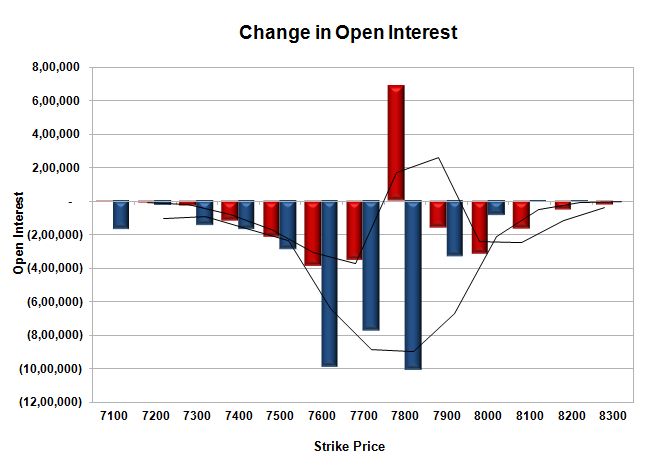 No Put option added OI at any strike with short covering seen at 7700 and above strike prices. Nifty Open Interest is at 1,48,49,950 down by 16,01,050, whereas Aug series added just 4.05 lacs with decrease in price, most probably some rollover with huge long liquidation. Bank Nifty Open Interest is at 18,45,775 down by 47,800, whereas Aug series added 1.34 lacs with decrease in price, most probably long liquidation in current series with huge short build-up in next series. FII’s sold 0.43 lacs Futures, which includes 9359 contracts long addition and 10211 contract short addition, with increase in net OI by 19570 contracts (includes 62794 longs to 63646 shorts for the day) and the average price per contract comes to around 7772.15. FII’s Index future open contract as on date is 235150 Longs to 163502 Shorts. Initial and best support now at 7700, with huge OI of 64.35 lacs. Initial resistance now at 7800, with OI of 53.93 lacs and above that at 7900 with huge OI of 55.40 lacs. 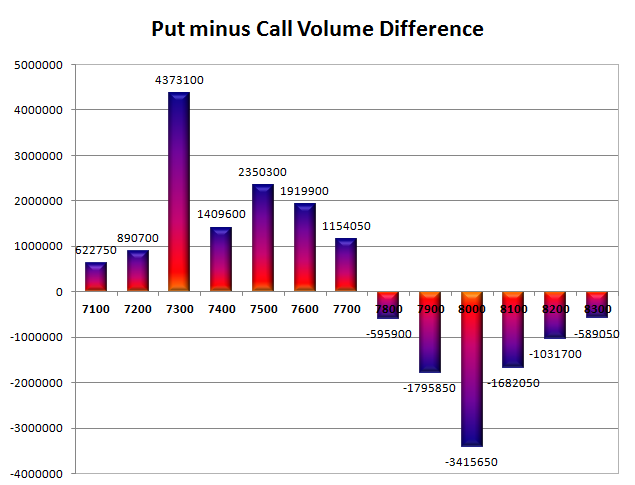 Day Range as per Option Table is 7730 - 7856 and as per VIX is 7732 - 7848 with 7793 as the Pivot. The index opened flat, and dipped to the lows of the day around 7772, within the first few minutes of trade. Nifty saw volatile moves within a narrow range for the better part of the day only to see the buyer coming back in the last hour to move the index above 7800 and a all time high closing at 7830.60, gain of 34.85 points. The broader market was flat, with 762 advances to 762 declines. Broader range for the series is at 7700-7900. 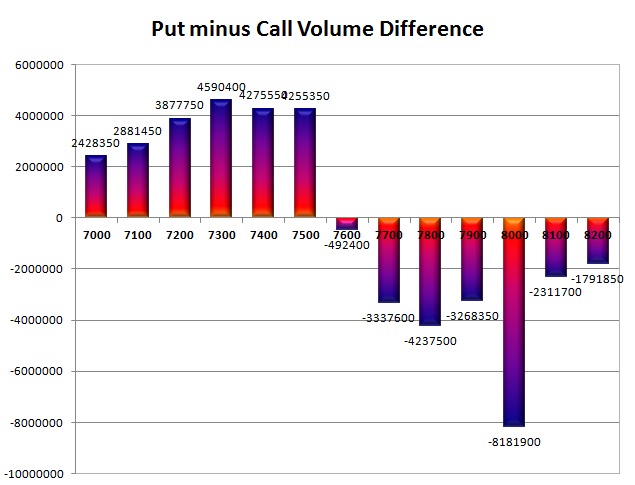 Call option 7900-8200 added 7.34 lacs huge amount of OI with short covering seen at 7700 and below strike prices. Put option 7900-7700 added 23.18 lacs huge amount of OI with profit booking seen at 7600 and below strike prices. 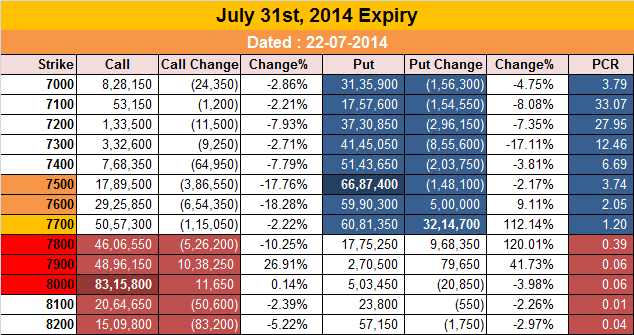 Nifty Open Interest is at 1,64,51,000 down by 3,70,500, with increase in price, most probably huge short covering. Bank Nifty Open Interest is at 18,93,575 down by 1,62,825, with increase in price, most probably huge short covering. FII’s sold, yes sold 1.08 lacs Futures, which includes 5578 contracts long liquidation and 3410 contract short covering, with decrease in net OI by 8988 contracts (includes 45694 longs to 47862 shorts for the day) and the average price per contract comes to around 7827.64. FII’s Index future open contract as on date is 225791 Longs to 153291 Shorts. PCR Open Interest (Volume) has moved up to 1.137. Initial support now at 7800, with huge addition of 17.04 lacs and below that at 7700 with huge OI of 72.15 lacs. Initial resistance now at 7900, with OI of 57.03 lacs and above that at 8000 with highest OI of 80.34 lacs. Day Range as per Option Table is 7733 - 7878 and as per VIX is 7770 - 7891 with 7813 as the Pivot. The index opened positive, and went on make new all time high within the first few minutes, but saw profit booking which dragged the index to touch the previous days close level. Nifty after staying in a narrow range closed strong at all time high just below 7800 at 7795.75, gain of 27.90 points. The broader market though was highly negative, with 581 advances to 956 declines. Broader range for the series is at 7600-7900. 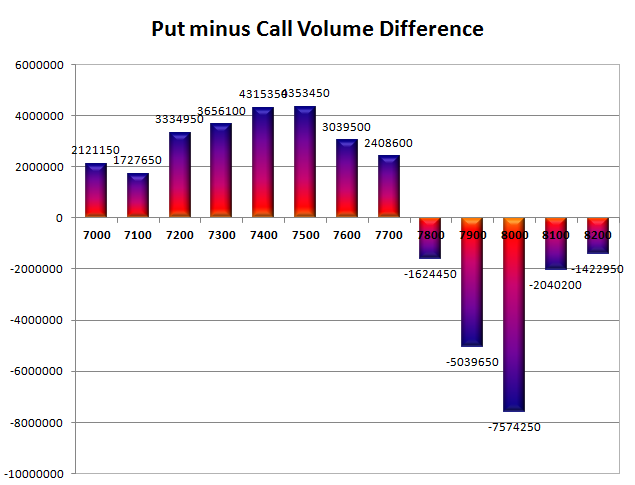 Call option 7800-7800 added 6.26 lacs huge amount of OI with short covering seen at 7700 and below strike prices. Put option 7900-7700 added 23.24 lacs huge amount of OI with profit booking seen at 7500 and below strike prices. 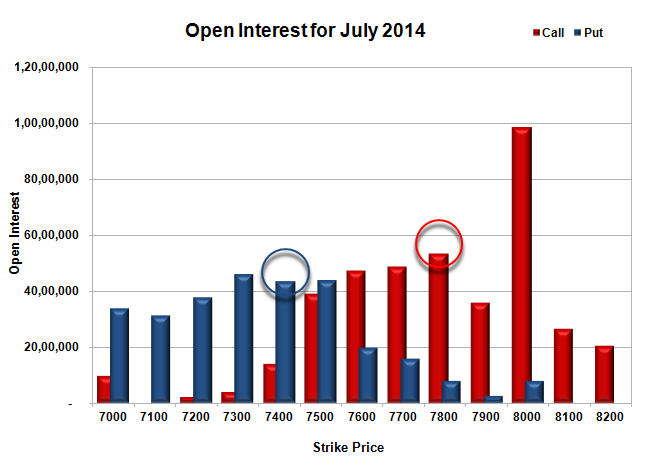 Nifty Open Interest is at 1,68,21,500 up by 4,22,850, with increase in price, most probably huge long build-up. 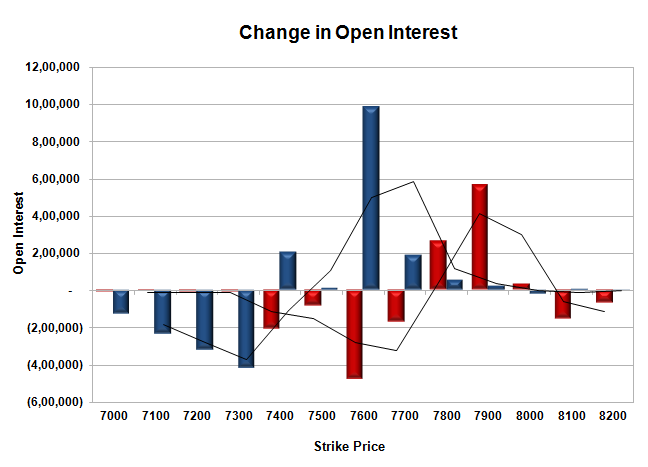 Bank Nifty Open Interest is at 20,56,400 down by 22,825, with increase in price, most probably short covering. FII’s bought 0.66 lacs Futures, which includes 11407 long build-up and 10077 short build-up, with increase in net OI by 1330 contracts (includes 58046 longs to 56716 shorts for the day) and the average price per contract comes to around 7785.17. FII’s Index future open contract as on date is 231369 Longs to 156701 Shorts. PCR Open Interest (Volume) is at the highest point of the series at 1.110. 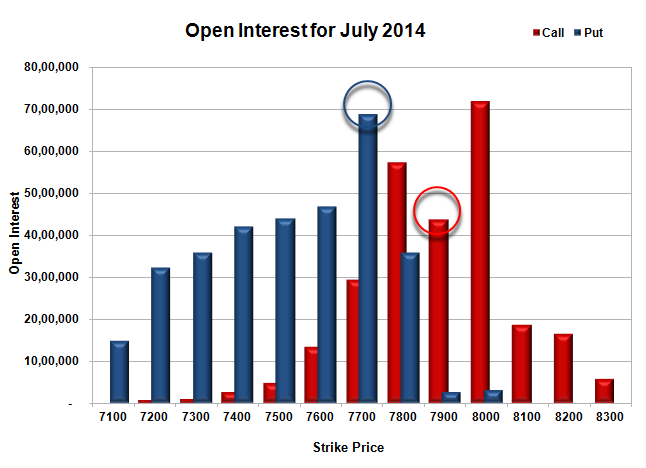 Initial and best support now at 7700, with huge OI of 69.87 lacs and below that at 7600 with huge OI of 60.27 lacs. 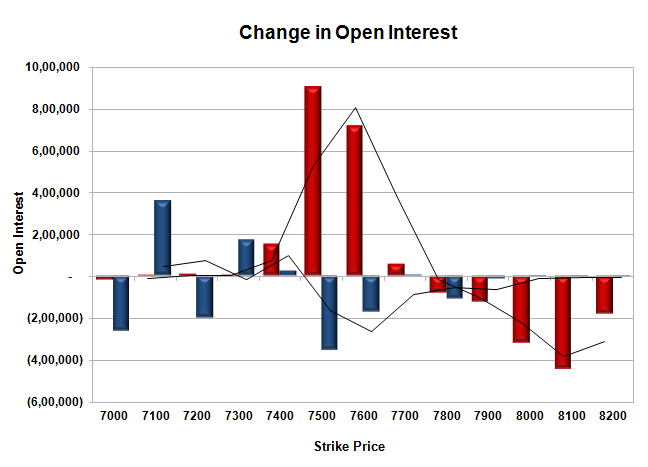 Initial resistance still at 7800, with OI of 46.86 lacs and above that at 7900 with OI of 54.42 lacs. 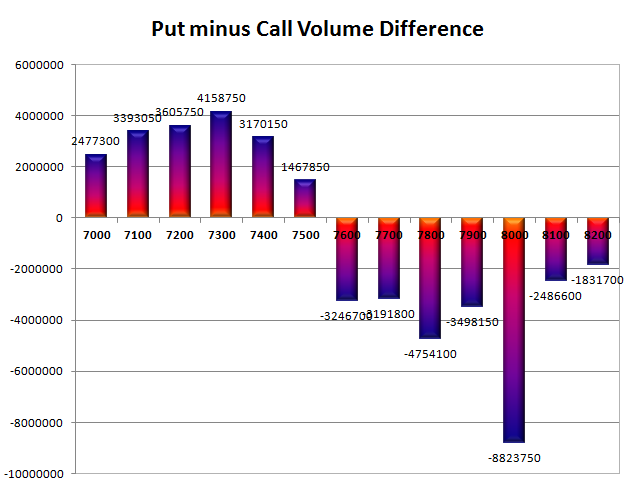 Day Range as per Option Table is 7724 - 7853 and as per VIX is 7736 - 7856 with 7786 as the Pivot. The index opened positive, and after staying within a small range for the first hour saw huge buying interest to move above 7750. A small sell-off saw the index back around 7720, but the Bulls used this opportunity to buy big and closed the index just a few points below all-time high level at 7767.85, a huge gain of 83.65 points. The broader market though was negative, with 752 advances to 808 declines. Broader range for the series is at 7500-7900. 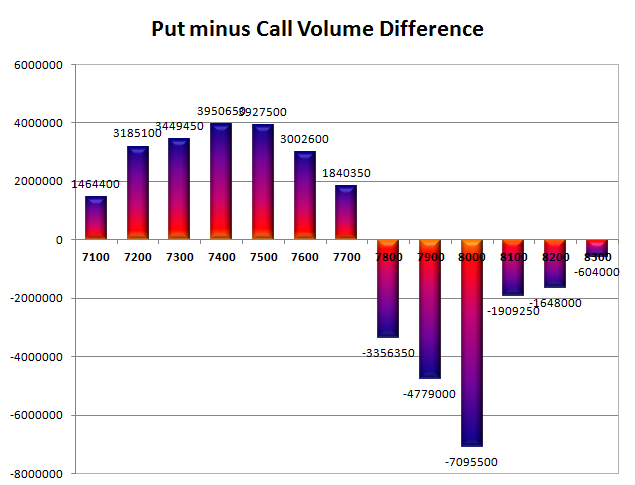 Call option 7900-8000 added 10.50 lacs huge amount of OI with short covering seen at 7700 and below strike prices. Put option 7900-7600 added 47.63 lacs huge amount of OI with profit booking seen at 7500 and below strike prices. 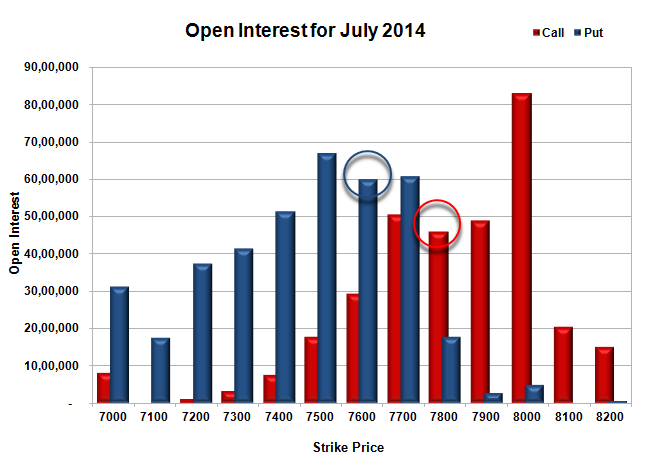 Nifty Open Interest is at 1,63,98,650 up by 13,89,150, with increase in price, most probably huge long build-up. 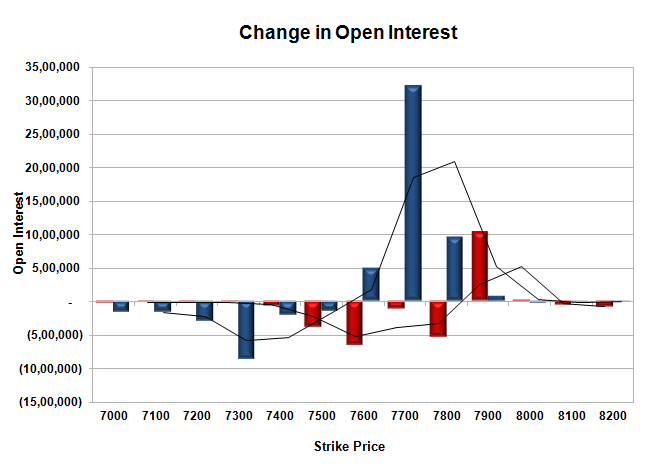 Bank Nifty Open Interest is at 20,79,225 down by 78,400, with increase in price, most probably huge short covering. FII’s bought huge 15.53 lacs Futures, which includes 29496 long build-up and 1560 short covering, with increase in net OI by 27936 contracts (includes 65614 longs to 34558 shorts for the day) and the average price per contract comes to around 7760.78. FII’s Index future open contract as on date is 219962 Longs to 146624 Shorts. PCR Open Interest (Volume) closed above 1 at 1.089. 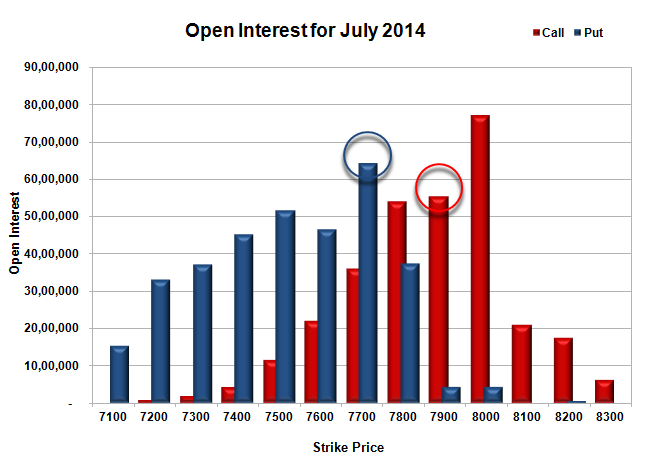 Initial support now at 7700, with huge OI of 60.81 lacs and below that at 7600 with huge OI of 59.90 lacs. Initial resistance now at 7800, with OI of 46.07 lacs and above that at 7900 with OI of 48.96 lacs. 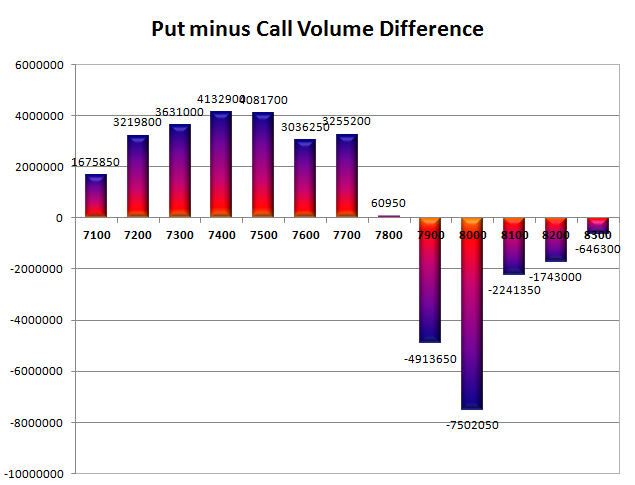 Day Range as per Option Table is 7685 - 7821 and as per VIX is 7708 - 7827 with 7749 as the Pivot. The index opened positive, and went on to touch the highs of the day at 7722, but saw selling pressure to move back below 7700 and close near the lows at 7684.20, still a gain of 20.30 points. The broader market was also positive, with 936 advances to 609 declines. Broader range for the series is at 7400-7800. 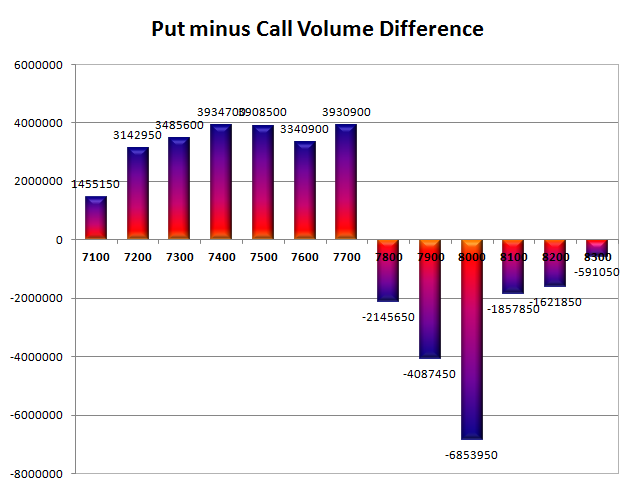 Call option 7800-8000 added 8.62 lacs huge amount of OI with short covering seen at 7600 and below strike prices. Put option 7700-7400 added 13.90 lacs huge amount of OI with profit booking seen at 7300 and below strike prices. 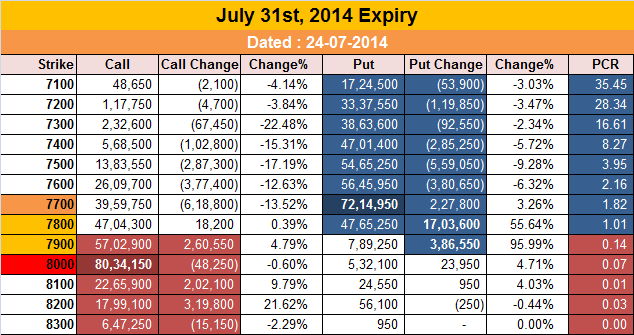 Nifty Open Interest is at 1,50,09,500 down by 13,500, with increase in price, most probably short covering. Bank Nifty Open Interest is at 21,57,625 down by 62,525, with small decrease in price, most probably huge long liquidation. FII’s bought 3.83 lacs Futures, which includes 2874 long build-up and 4795 short covering, with decrease in net OI by 1921 contracts (includes 29333 longs to 21664 shorts for the day) and the average price per contract comes to around 7688.74. FII’s Index future open contract as on date is 190466 Longs to 148184 Shorts. PCR Open Interest (Volume) closed just below 1 at 0.986. Initial support getting better at 7600, with huge OI of 54.90 lacs and below that at 7500 with huge OI of 68.35 lacs. Initial resistance still at 7700, with huge OI of 51.72 lacs and above that at 7800 with OI of 51.33 lacs. Day Range as per Option Table is 7618 - 7760 and as per VIX is 7624 - 7744 with 7693 as the Pivot. The index opened weak, and went on to touch the lows of the day 7595 on the back of Bad Global cues. The responsive buyer took control from thereon to push the index back in green making a high of 7685, but closed just lower at 7663.90, a gain of 23.45 points. On a week on week basis the index gained 204.30 points or approx 2.74%. The broader market though was weak, with 688 advances to 849 declines. Broader range for the series is at 7400-7800. No Call option addition though short covering seen at 7700 and below strike prices. Put option 7700-7500, 7300-7200 added 22.21 lacs huge amount of OI with profit booking seen at 7100 and below strike prices. 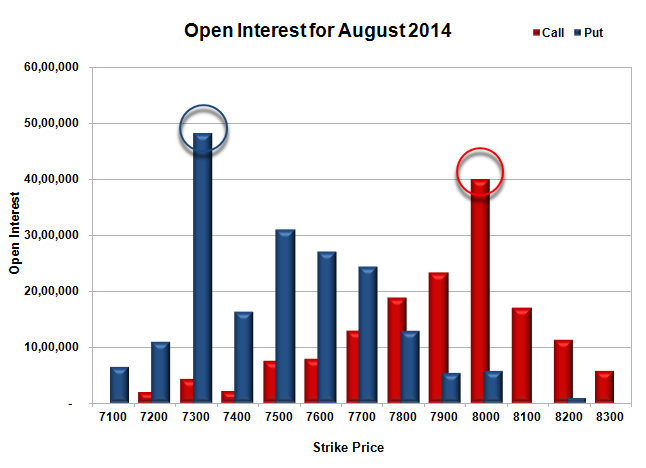 Nifty Open Interest is at 1,50,23,000 up by 2,07,900, with increase in price, most probably long/short build-up. 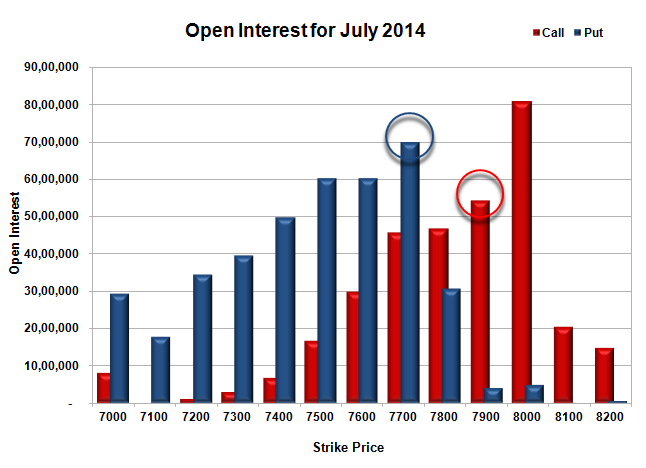 Bank Nifty Open Interest is at 22,20,150 up by 51,550, with increase in price, most probably huge long build-up. FII’s sold huge 4.88 lacs Futures, which includes 6628 long liquidation and 3125 short addition, with decrease in net OI by 3503 contracts (includes 36992 longs to 46745 shorts for the day) and the average price per contract comes to around 7675.23. FII’s Index future open contract as on date is 187592 Longs to 152979 Shorts. PCR Open Interest (Volume) is at 0.973. 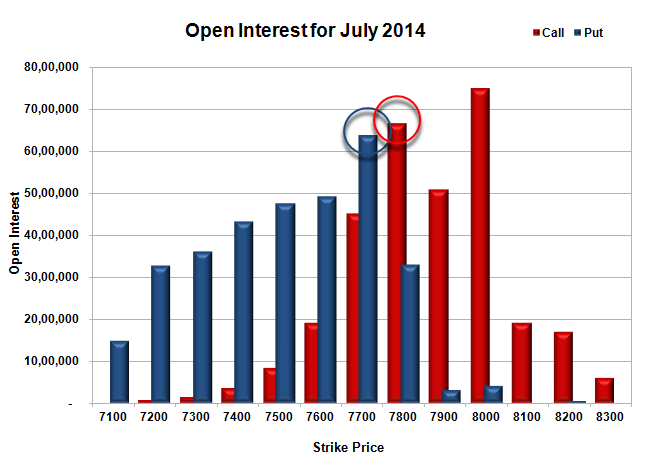 Initial support at 7600, with huge OI of 45.03 lacs and below that at 7500 with huge OI of 68.25 lacs. 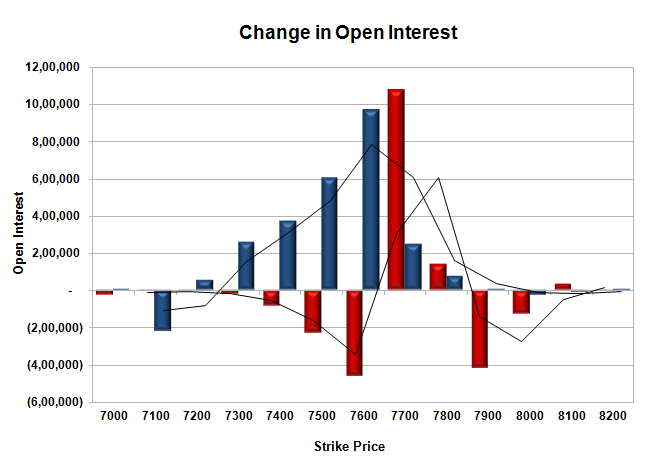 Initial resistance at 7700, with huge OI of 53.45 lacs and above that at 7800 with OI of 48.71 lacs. Day Range as per Option Table is 7578 - 7725 and as per VIX is 7603 - 7724 with 7648 as the Pivot. The index opened weak, but went up above the dotted line within the first few minutes, and stayed in a narrow range with positive bias. The index closed just positive at 7640.45, a gain of 16.05 points. The broader market was also strong, with 1034 advances to 501 declines. Broader range for the series is at 7400-7800. 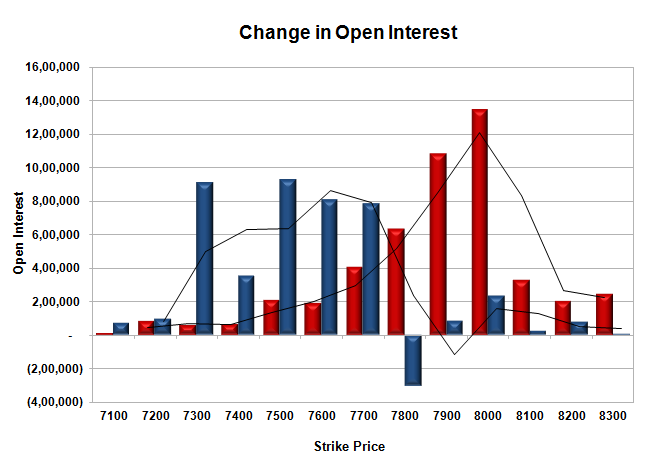 Call option 7700-7800 added 12.16 lacs huge amount of OI with short covering seen at 7600 and below strike prices. Put option 7700-7300 added 24.49 lacs huge amount of OI with profit booking seen at 7100 and below strike prices. 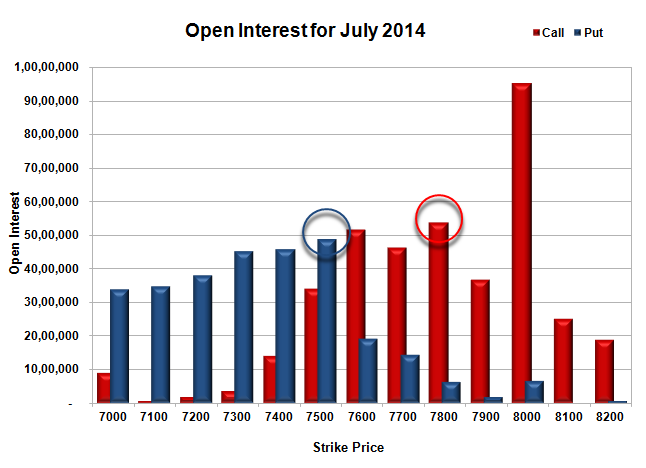 Nifty Open Interest is at 1,48,15,100 up by 2,67,200, with increase in price, most probably long build-up. Bank Nifty Open Interest is at 21,68,600 down by 1,28,300, with no change in price, most probably huge short covering. FII’s bought huge 6.82 lacs Futures, which includes 6553 long addition and 7083 short covering, with increase in net OI by 13636 contracts (includes 61531 longs to 47895 shorts for the day) and the average price per contract comes to around 7655.85. FII’s Index future open contract as on date is 194220 Longs to 149854 Shorts. PCR Open Interest (Volume) is at 0.911. Initial support now at 7600, with huge OI addition for the day at 9.69 lacs and below that at 7500 with huge OI of 66.81 lacs. Initial resistance at 7700, with huge OI of 54.47 lacs and above that at 7800 with OI of 49.22 lacs. 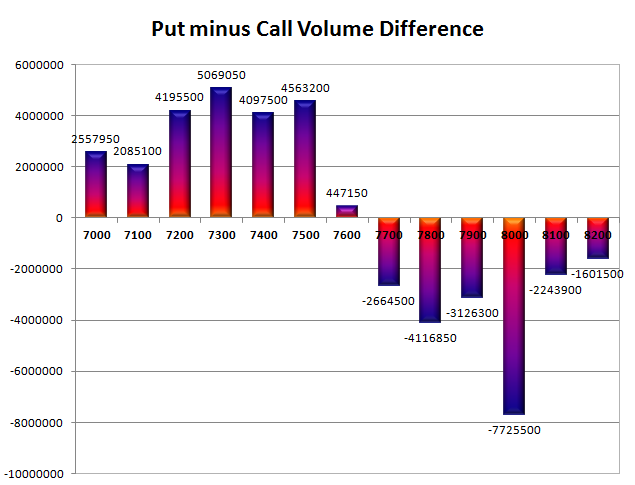 Day Range as per Option Table is 7561 - 7711 and as per VIX is 7581 - 7700 with 7636 as the Pivot. The index opened strong and stayed in a narrow range with positive bias, but a small dip to the lows of the day saw the buyers come back and moved the index above 7600. The index closed near the highs of the day at 7624.40, a huge gain of 97.75 points. The broader market was also strong, with 1161 advances to 389 declines. Broader range for the series is at 7400-7800. 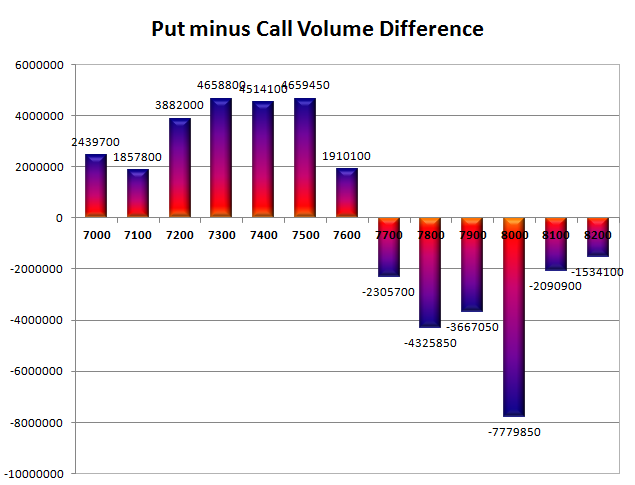 Call option 7900 added 1.73 lacs huge amount of OI with short covering seen at 7600 and below strike prices. Put option 7700-7200 added 32.44 lacs huge amount of OI with profit booking seen at 7100 and below strike prices. 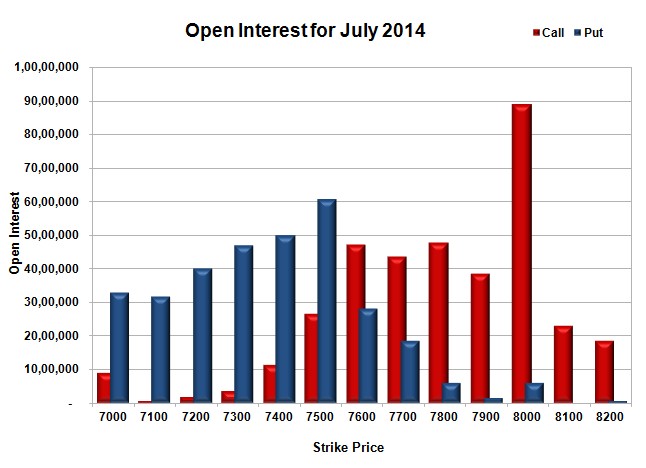 Nifty Open Interest is at 1,45,47,900 up by 1,64,100, with increase in price, most probably long build-up. Bank Nifty Open Interest is at 22,96,900 up by 1,77,950, with increase in price, most probably huge long build-up. FII’s sold 0.32 lacs Futures, which includes 18754 long addition and 19384 short addition, with increase in net OI by 38138 contracts (includes 59912 longs to 60542 shorts for the day) and the average price per contract comes to around 7642.90. FII’s Index future open contract as on date is 187667 Longs to 156937 Shorts. PCR Open Interest (Volume) has moved up to 0.849. Initial support now at 7600, with huge OI addition for the day at 8.74 lacs and below that at 7500 with huge OI of 60.77 lacs. 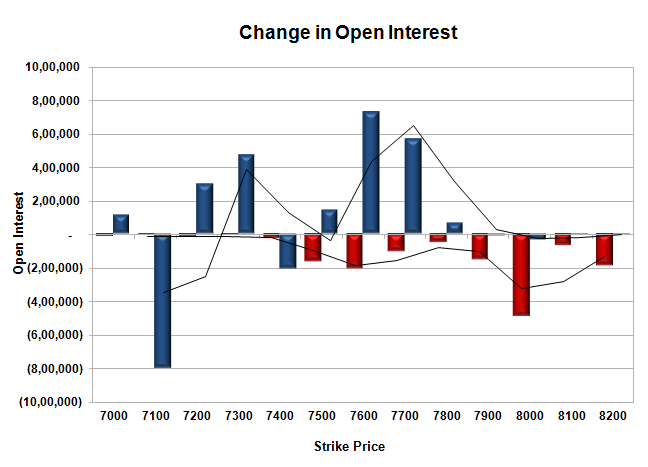 Initial resistance has moved up to 7700, with OI of 43.73 lacs and above that at 7800 with huge OI of 47.80 lacs. Day Range as per Option Table is 7525 - 7687 and as per VIX is 7566 - 7683 with 7599 as the Pivot. The index opened strong just below 7500 but saw huge buying interest to move above 7500. Profit booking saw the index to the lows of the day around 7460, but the buyers came back and saw the index back to the highs of the day at 7535, but closed just lower at 7526.65, a huge gain of 72.50 points. The broader market was also strong, with 1134 advances to 412 declines. Broader range for the series is still at 7300-7800. 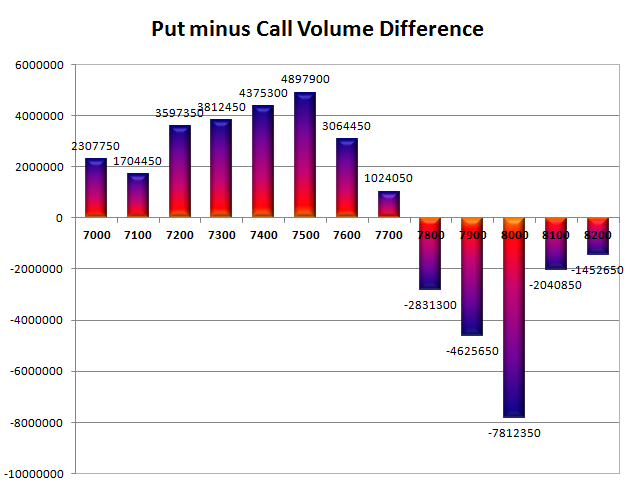 Call option 7600 added 4.23 lacs huge amount of OI with short covering seen at 7500 and below strike prices. Put option 7500-7400, 7100 added 10.16 lacs huge amount of OI with short covering seen at 7700 and above strike prices. 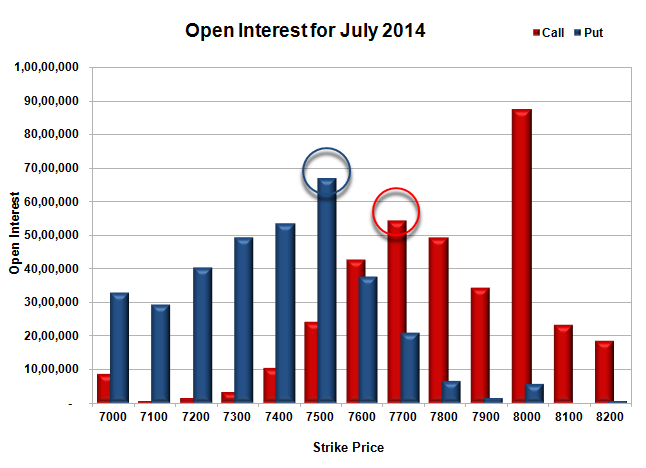 Nifty Open Interest is at 1,43,83,800 up by 2,23,700, with increase in price, most probably long build-up. Bank Nifty Open Interest is at 21,18,950 up by 10,725, with increase in price, most probably small long build-up. FII’s bought 0.90 lacs Futures, which includes 8503 long addition and 6709 short addition, with net OI increased by 15212 contracts (includes 37793 longs to 35999 shorts for the day) and the average price per contract comes to around 7525.07. FII’s Index future open contract as on date is 168913 Longs to 137553 Shorts. PCR Open Interest (Volume) is at 0.731. 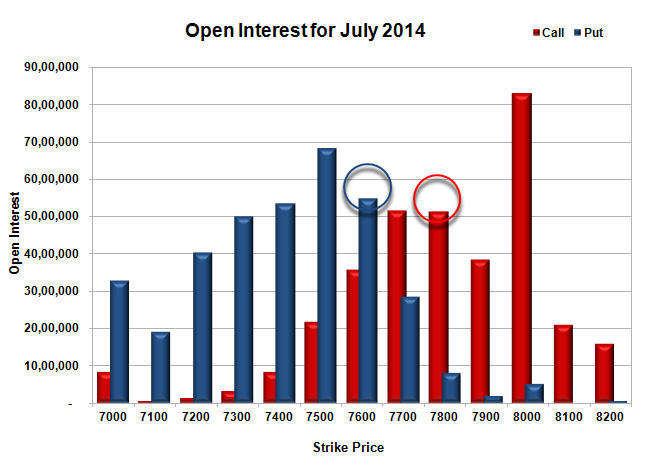 Initial and best support now at 7500, with huge OI of 48.67 lacs and below that at 7400 with OI of 45.78 lacs. Initial resistance at 7600, with huge OI of 51.75 lacs and above that at 7700 with huge OI of 46.45 lacs. Day Range as per Option Table is 7430 - 7596 and as per VIX is 7468 - 7585 with 7507 as the Pivot. The index opened flat to positive and stayed in a narrow range for the entire session with the bias being negative, but closed just flat at 7454.15, a small loss of 5.45 points. The broader market was also weak, with 586 advances to 955 declines. Broader range for the series has shifted down to 7300-7800. Call option 7400-7700 added 18.32 lacs huge amount of OI with profit booking seen at 7800 and above strike prices. Put option 7400-7300, 7100 added 5.59 lacs huge amount of OI with short covering seen at 7500 and above strike prices. 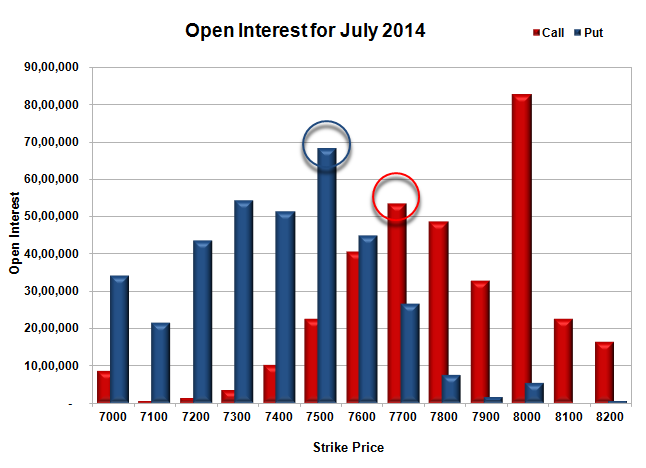 Nifty Open Interest is at 1,41,60,100 up by 4,44,100, with no change in price, most probably long build-up. 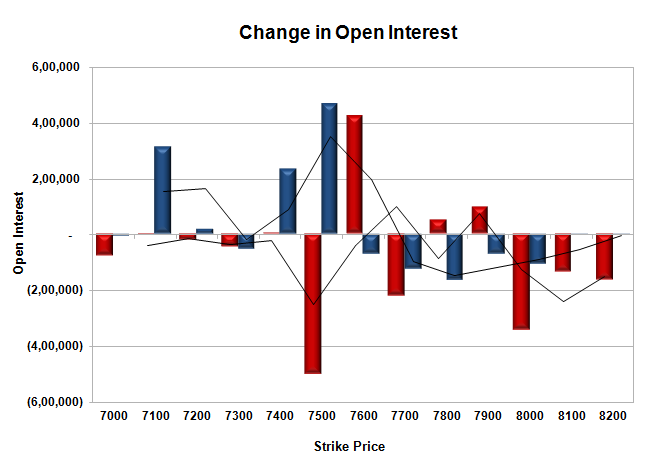 Bank Nifty Open Interest is at 21,08,225 down by 2,250, with increase in price, most probably small short covering. FII’s bought huge 6.73 lacs Futures, which includes 4994 long addition and 8463 short covering, with net OI decreased by 3469 contracts (includes 38881 longs to 25424 shorts for the day) and the average price per contract comes to around 7441.43. FII’s Index future open contract as on date is 160410 Longs to 130844 Shorts. 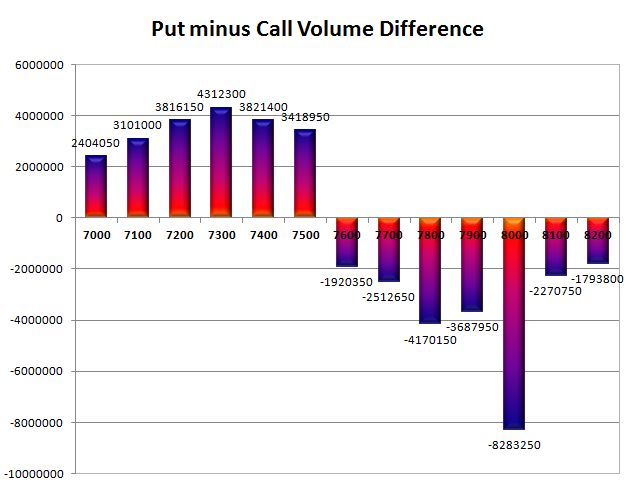 PCR Open Interest (Volume) is very weak at 0.706. Initial support at 7400, with huge OI of 43.44 lacs and below that at 7300 with OI of 45.81 lacs. 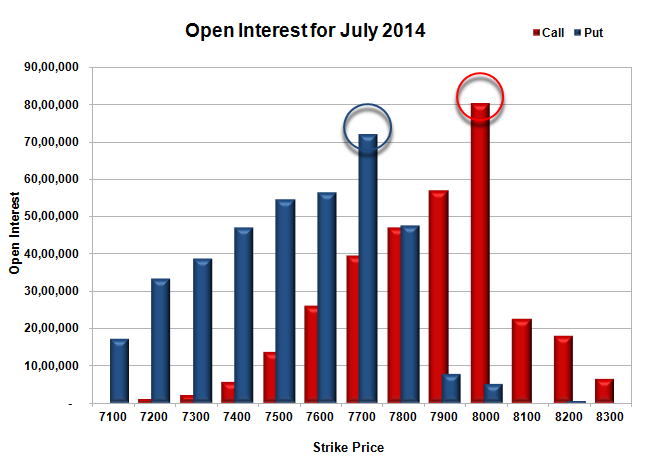 Initial resistance now at 7500, with huge OI addition of 9.03 lacs and above that at 7600 with huge OI of 47.52 lacs. Day Range as per Option Table is 7369 - 7540 and as per VIX is 7393 - 7515 with 7452 as the Pivot.